Tennessee has had a reputation for toughness since the Battle of New Orleans during the War of 1812 when a group of volunteers made up of Choctaw Indians, free men of color and ragtag group of militia whooped the butts of the well-trained British soldiers. Ten years later, Tennessee again stepped up to the plate to fight a war against Mexico. On the local front, during the Civil War, our city of La Vergne was destroyed. What was rebuilt was again destroyed in two tornadoes that were three weeks apart. We rebuilt again. Obviously, we are a tough and ready group of people who live in La Vergne, Tennessee!! We might argue among ourselves, but when we see someone in need we come together to support that person or the family. Two examples come to mind right away. In the Lake Forest subdivision, a two-month old baby passed away last week – a terrible, sad tragedy for the family. The neighbors came together to support the family both in prayer and to help meet their physical needs. Our deep and sincere sympathies to the family on Watersedge. Another family is struggling with medical and regular bills since the father suffered aneurisms several Sundays ago. There will be a road block next Saturday at Stones River Road and Murfreesboro Road from 9:00 a.m. – 1:00 p.m. Any loose change you have would help, but bigger bills will also gladly be accepted. A spaghetti dinner is planned that evening at the LaVergne Senior Center. If you can’t help, that’s okay. But if you can, the family would appreciate it. The fairly new LaVergne Garden Club is meeting today at 10:00 a.m. to finish planting the butterfly garden behind the Library. If you’ve ever gone to the library, you know there is a sitting area between the children’s and adult sections. There are some pretty big windows there and that’s exactly where the work is being done – in the flower bed under those windows. Last weekend five adults and three children helped clear out the ugly bushes and today they will plant bulbs, butterfly bushes, and put in the finishing mulch. A great opportunity to volunteer in the community will be for the playground build for Lake Forest Estates. There are a lot of things that need to be done before the city reaches the actual “build” day – volunteer coordination, fundraising, planning, etc. (with fundraising being the BIGGEST challenge – so now is the time to jump in and help. You can learn more about why this project is important to the city here. Another opportunity to volunteer is joining Box 100, the volunteer rehab group that is available to provide relief to police, fire and other city personnel at the scene of emergencies. The group formed in May 2006 and has had a strong presence at community events ever since. They provide traffic assistance during parades, they help with litter clean up, they are the ones on-hand to cook burgers and hot-dogs at events like National Night Out, and they are working closely with the city emergency services coordinator and Alderman Tom Broeker to sign-up residents for CodeRED. They need volunteers both to respond to emergencies when they occur (you can help according to your schedule) and to help with community events. If you are interested in joining, the meetings are the first Mondays of every month at 6:30 at Fire Station 3 on Bill Stewart Blvd. Park behind the fire station and go in the back door. The conference room is on the left when you go in. Box 100 can be reached on Facebook for additional information. The La Vergne Rescue Unit is also a volunteer organization that has been around since 1970. Famous for their country ham breakfasts that help fund the organization, they have also been on-hand to save lives for more than 40 years. You can reach them here for more information. There are a lot of opportunities – all you have to do is log-off your computer, turn off the TV, gather up the kids (pets are also welcome), and take that first step. 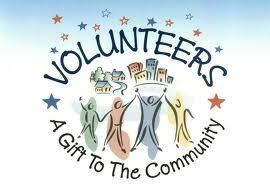 Just as Tennessee takes pride as the Volunteer State, LaVergne also loves its volunteers! I love love love this article!!! We do have a tendency to gripe back and forth but everyone ALWAYS pulls together when there is a true need for it! I am so proud of this city and all the wonderful folks who live here. I wouldn’t want to be anywhere else!!! Thanks Lola for another great article! !